Previously, we discussed about UART. What is I²C Protocol? I squared C (also pronounced as I-two-C) or I²C is a bus serial communication protocol designed by Philips for home automation and home electronics applications. Since 2006, licensing fees not needed to implement the I²C protocol. Fees needed to obtain I²C slave addresses allocated by NXP. I²C can connect a microprocessor and various circuits. In computing, a bus means a communication system which transfers data between components inside a computer, or between two or multiple computers. What is relevance of I²C in Arduino? Previously we talked about RX TX in Arduino and serial connection (in the article on UART) too. Each I²C bus consists of two signals – SCL (clock signal) and SDA (data signal). You noticed them on various Arduino modules as pins. We can use it by including Wire library. From our previous discussions, serial ports are asynchronous. So no clock data is transmitted. Hence the devices using serial ports must have agreement of time on a data rate. Two devices need to have clocks which are close to the same rate. Too much difference will cause garbled data. 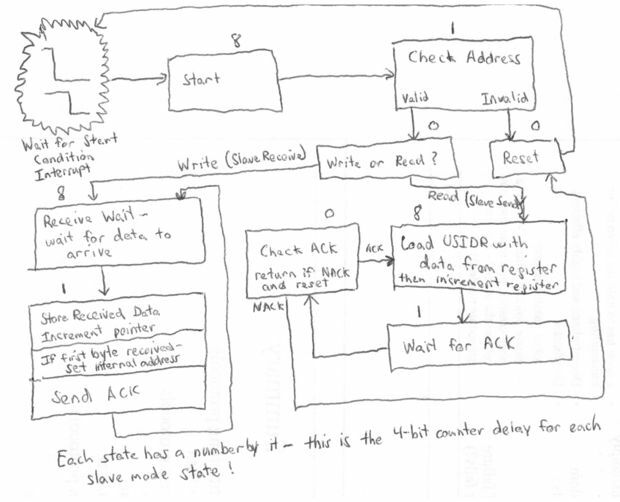 Asynchronous serial ports demands hardware – UART, which is somewhat complex. Also asynchronous serial ports inherently suited to communications between only two devices. There is no theoretical limit to asynchronous serial communications, but most UART devices only support a certain set of fixed baud rates. SCL (Serial Clock Line): bidirectional synchronization clock line. The 2 lines are pulled at voltage level VDD through pull-up resistors. Maximum number of devices is limited by the number of available addresses, 7 address bits and one R/W bit (read or write), ie 128 devices, but it also depends on the bus capacity (on which depends the maximum speed of the bus). It should be noted that addresses are reserved to broadcast messages and that many addresses are already allocated by manufacturers which greatly limits the number of devices (a variant of 10-bit addressing also exists). In Ultra-fast mode (UFm) mode, the bus is unidirectional, so there can only be one master. The 2 lines are renamed USCL (clock line) and USDA (data line), and the master side, they are always output and push-pull type. This mode has limited use. the logical state “1” or “HIGH” is the “recessive” state. When the bus is not in use, it is high (through pull-up resistors). Ultra-fast mode (UFm) ≤ 5 Mbit/s, unidirectional only. To initiate the address frame, the master device leaves SCL high and pulls SDA low. The address frame is always first in any new communication sequence. For a 7-bit address, the address is clocked out most significant bit (MSB) first, followed by a R/W bit indicating whether this is a read (1) or write (0) operation.The 9th bit of the frame is the NACK/ACK bit. After the address frame has been sent, data can begin being transmitted. During data writing operation, the value on SDA not changed to avoid imposing false stop condition. Once all the data frames have been sent, the master will generate a stop condition. Stop conditions are defined by a 0 to 1 (low to high) transition on SDA after a 0 to 1 transition on SCL. In this situation, SCL remains high. This Article Has Been Shared 120 Times! Cite this article as: Abhishek Ghosh, "What is I²C Protocol? Relevance of I²C in Arduino," in The Customize Windows, June 12, 2018, April 21, 2019, https://thecustomizewindows.com/2018/06/what-is-i2c-protocol-relevance-of-i2c-in-arduino/.